Or you read the name below JH Curtis’s differently? I got a bit confused since my records said Curtis left his estate to his sister Anne and his wife’s name is Sophia Newman. 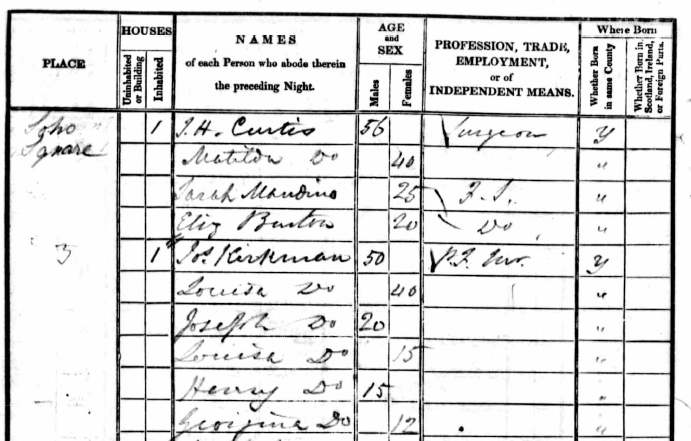 “Do” means ditto in the census. Matilda Do is Matilda Curtis. She is 40 years of age with no occupation. it is not clear to how she is related to J H Curtis. There are two FS (female servants) in that household in Soho Square in 1841. You may be interested that I was born deaf and that I attended the Royal School for the Deaf, Margate between 1961 and 1968 before going on to Mary Hare Grammar School for the Deaf in Newbury from 1968 and 1975. This has been really helpful! I appreciate your comment. And how lovely of you to share your background!–I’m always thrilled when my readers share with me their connection with the Royal School. It’s remarkable how long the institution has been around and how many students went through its doors.